AARON MATE: This is Jill Wine-Banks. She was a prosecutor during the Watergate case, and she was speaking on MSNBC. And Paul, I want you to hear what she compared- what she compared Monday’s moment of Trump doubting U.S. intelligence agencies to. This is what she said. 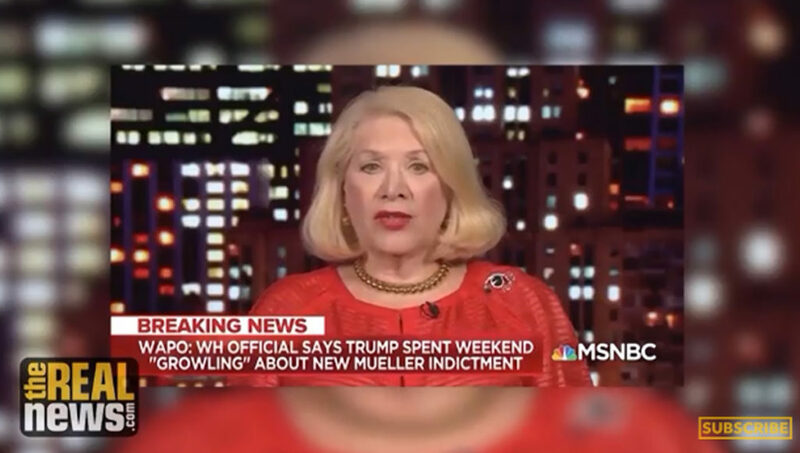 JILL WINE-BANKS: It’s just as serious to me as the Cuban missile crisis, in terms of an attack, or the 9/11 attack. The president is taking the side of the people who attacked us, instead of trying to prevent a future attack. He has done nothing to make sure that the elections four months away are going to be safe. And I would say that his performance today will live in infamy as much as the Pearl Harbor attack or Kristallnacht. And it’s really a serious issue that we need to deal with. PAUL JAY: I missed- who was that? AARON MATE: That was Jill Wine-Banks. She is now an MSNBC analyst, but she was a prosecutor in the Watergate case against Nixon. So we have there, we have 9/11, we have Pearl Harbor, and we’ve heard that before. That’s not novel to her. Many people have adopted that. Pundits across the spectrum, lawmakers. But what I haven’t heard yet in all of these historical analogs that have been invoked to talk about alleged Russian email hacking, hacking of the DNC and juvenile social media ads and alleged bots, is Kristallnacht, the 1938 pogrom in Germany by the Nazis against Jews. So her saying that Trump questioning U.S. intelligence agencies will take its place in history alongside Kristallnacht. Paul Jay. PAUL JAY: Well, what can you say? The level of idiocy that we’re hearing on corporate news- I mean, she’s beyond idiotic. I’m actually- if one’s going to be concerned about this stuff, more concerned of what you showed earlier, what’s coming out of the mouths of supposed journalists that are supposedly rational. She’s a nutcase. So I would- you know, you know sometimes when you, when they assess a measure of things, they take people off the extreme on one side, takes people off the extreme on the other and measure the middle. So I wouldn’t even count her. She’s just too nuts. But the, the whole level of rhetoric, we need to try to understand better why it’s at such a crazy fervor. And it’s a convergence of interests here that are converging on anti-Trump. Now, let me, let me first of all say I welcome all of it, in a sense. I don’t like all the crazy propaganda about American democracy, which doesn’t exist in the way they talk about it. The anti-Russia stuff is dangerous, because they’re two nuclear powers. But the fact that the American government, the state is so dysfunctional, and that this Trump administration is so relatively paralyzed by all this, is a good thing. I like when they all fight with each other. I just don’t think we, as rational people, should buy into the rhetoric and B.S. on any of the sides of this. And we need to help as The Real News. Our job is to help make realistic sense of this so ordinary people don’t get fooled by it so easily. The, the, I mean, to compare this to anything at the level of war, Pearl Harbor’s, and all this, just inflammatory for nothing. AARON MATE: All right, Paul, so let me get to some questions for you, because I have some questions about this issue. And this speaks to what’s going on on the left right now, because this issue has become very divisive on the left. I personally saw in my Twitter feed many people who I really respect parroting or echoing the lines of others, that Trump’s comments doubting US intelligence agencies were treasonous, and using that kind of language. And there is, we’re seeing a real split right now. So let me read you a few viewer comments. Christian Devries writes, Paul, why do you think-. And I love this question, by the way, because I think it points out that we’ve been the exception. Why do you think progressive online media outlets are not questioning Russiagate? Except for The Real News, I should add, Christian. And Dave Rubin writes, Paul, I’ve actually been accused of treason by left-wing family members for voicing similar lines of argument. This Russia stuff is totally stifling. How do we combat this? And finally, Carlo Mando writes: Why does pointing out that current liberals are hypocrites automatically make the person pointing these things out a Trump supporter? PAUL JAY: The Cold War McCarthyite period, the House Un-American Activities Committee coming out of World War II is deep in the American psyche. The United States coming out of World War II, soldiers coming back, especially black soldiers, but poor working-class soldiers that went to fight against fascism and fight for democracy came home, and they said, you know, we want some of that democracy and freedom. Because you know, coming out of the crisis of the ’30s, the amount of attacks on unionization, the denial of people’s democratic rights, and then now they’re asked to go fight for all of this. And similar asking what Martin Luther King pointed out, you’re asking poor white and black soldiers to go to Vietnam and fight for ideals they never see at home. So coming out of World War II, the United States and the American people were very poised for quite a radical move. And politically, the person that most represented that was Vice President Henry Wallace, Roosevelt’s vice president, that had a progressive agenda both economically and geopolitically that is, you know, far to the left of Bernie Sanders. And that’s, he was vice president. Well, he gets overthrown in the Democratic Party convention in, I guess it’s ’45, and he gets replaced with Truman. And what follows is an attempt to undo the strength and influence of progressive public opinion in the United States. In Hollywood, in the unions, amongst teachers in the government. A massive purge takes place. Thousands and thousands of people are fired for what they believe, not because they’re doing anything that harms America. Quite the contrary. It was a political, ideological terror campaign. And then the, of course the media is all in on this. Even after the downfall of McCarthy. I remember growing up, I used to see shows on TV. You know, I was a commie, a communist for the FBI. You know, the specter of the Russians are coming, the Russians are coming. It’s deep, deep in the American culture and psyche. So even when the Soviet Union collapses, because this was supposedly about godless communism, well, now you’ve got Christian capitalism, and you’re carrying on exactly the same way. So now you got to wonder what was this really all about. And it goes back to what I was saying earlier, it goes about a narrative needed by the military-industrial complex to spend a trillion dollars a year on arms. The regional politics, and so on. It never was about what they said it was about. So I may have lost a little bit of train for what your question was. But the fear of the Russians, the idea that the Russians are this existential enemy out there coming to get us, this is what the liberals, the Rachel Maddows, are playing on. The whole, that whole establishment that’s supposedly progressive are harkening up the, a nightmare of the past that still lives in people’s brains. AARON MATE: You know, Paul, I’m reminded, talking about Rachel Maddow and progressives, in one of the first segments we did, I’d written a piece about Rachel Maddow, just critiquing her coverage. This is over a year ago. And you and I had a little tiff over whether or not we can call Rachel Maddow progressive. I argued yes, we can. You argued definitely not. I, after more than a year later, I totally concede that argument, you were 100 percent right. She has been-. 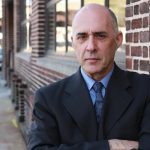 PAUL JAY: I hope someone out there is writing down Aaron actually said Paul is 100 percent right about something. People don’t know how much we argue behind the scenes. We probably should do that more on camera. AARON MATE: Yes. It’d be more productive for everybody. Or not, actually. I’m not- people want to see us arguing. And you have many viewers Paul, by the way, who are echoing what you’re saying here about a distraction from, from the real issues, and needing an enemy. Max writes: isn’t Trump the best distraction while we’re in the midst of the sixth mass extinction, absurd wealth equality, on the brink of financial collapse, and close to nuclear war? Liberals are holding the institutions of our oppression, and scapegoating Trump. PAUL JAY: It’s more complicated than that, I think. AARON MATE: Well, in Max’s defense, he only has an Internet field to write his comment. I mean certainly-. PAUL JAY: I would just say that Trump is not there is some deliberate distraction. He is. But Trump-. The most important thing, and this is what doesn’t get talked about enough everywhere, is we got to understand the underlying systemic reasons the political culture is in such decay. And the underlying issue has to do with the amount of wealth that’s been transferred to so few hands, and how parasitical it is. That wealth is not generating new production, new productive investment. That so much of the global wealth, something like, you know, I think I said this before. The amount of money available for investment and speculation is something like $350 trillion, when the global GDP is only $80 trillion. When you have the stage of capitalism of such parasitism, the politics reflects that. And, and you know, Obama was this wonderful, charming, smiling face of the same decaying system. I mean, who does he appoint as his financial team? Obama- first thing he does is brings around him all the moguls of Wall Street who, who managed the ’07-’08 financial crisis in a way to make sure Wall Street comes out like bandits- and they are bandits. And so- but the point is, the system itself is decaying. And we better recognize we’re into a new phase of this system. And I keep harping on this. Imagine a system facing this apocalyptic crisis of climate change, and no one even talks about it. Like, nobody. I mean, I shouldn’t say nobody. Obviously there’s activists, and all that. But I mean in terms of mainstream media, mainstream politics. It’s barely recognizable on the agenda of things that matter. This is a sign of decay. And not just about Trump. AARON MATE: Right. So Paul, it’s interesting. You mentioned Obama. Yesterday he gave this major speech at the Mandela lecture where he criticized corporate globalization, and talked about massive economic inequality, and got a lot of attention for it. One of his comments was there has been an explosion in economic inequality; a few dozen individuals control the same amount of wealth as the poorest half of humanity. That’s not an exaggeration. That’s a statistic. Think about that. That was Obama. And then, so the Twitter user-. PAUL JAY: And he greatly contributed to. AARON MATE: Well, exactly. So the Twitter user PrettyBadLefty, who I recommend people check out, is very good, he tweeted that, and he wrote: Damn, if only this dude had been in a position of power for almost a decade.